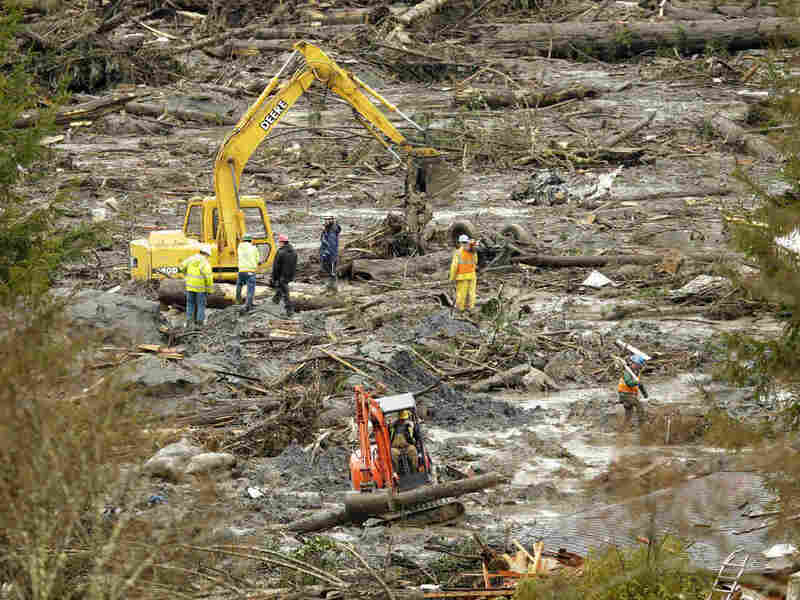 In U.S., Mudslides Common, But Usually Few Deaths : The Two-Way As teams continue digging through the wreckage of the small communities destroyed by the Washington state mudslide, we answer some questions about this natural phenomenon. Workers use heavy equipment to clear trees and other debris, near Darrington, Wash., on Thursday. Washington state, with its many steep slopes, streams and rivers and some of the heaviest annual rainfall in the country, is a mudslide waiting to happen. Add in soil erosion from logging, as was reportedly the case near the community of Oso before last week's tragedy, and the probability of such an event increases. And, as we now know, this was just the latest in a string of mudslides in the area over the years as well as (apparently unheeded) official warnings about the potential for such a disaster. What's the difference between a landslide and a mudslide? Landslides occur when masses of rock, earth or debris move down a slope. Debris flows, also known as mudslides, are a common type of fast-moving landslide that tends to flow in channels, according to a Centers for Disease Control and Prevention fact sheet. Unstable soil, heavy rain, especially following droughts, earthquakes or volcanic eruptions. Mudslides occur when the soil becomes saturated on steep slopes. In Oso, for example, the area received up to twice the normal rainfall for the 45 days before the mudslide — 15 inches above the norm for this time of year. "As the moisture gets more and more it's pushing the particles apart. It makes them slippery and has less friction. The force of gravity is constantly trying to pull things down," Brent Bower, hydrologist, was quoted as saying by King 5 TV. To make matters worse, a 7-acre forest clear-cut "went right up to the edge of the groundwater danger zone" near Oso, Aaron Everett, a Washington state forester, tells NPR member station KUOW. How often do these events occur? The U.S. Geological Survey says that landslides are not uncommon. As recently as November, there was one in Colorado that injured several people and killed one man who was "buried beneath significant amounts of debris." The CDC says landslides and mudslides kill an average of about 25 to 50 people in the U.S. each year. Having said that, it's already clear from the Oso mudslide that 2014 will not be an average year. The states considered most vulnerable are Washington, Oregon, California, Alaska and Hawaii. When and where did the biggest landslide/mudslide occur? The largest mudslide in recorded history occurred just 140 miles south of Oso, on the slope of Mount St. Helens, when the volcano erupted in May 1980. The intense heat from the eruption "instantly turned more than 70% of the snow and glacial ice on the mountain to water. This massive movement of rock, ash, water and downed trees swept into Spirit Lake and down the north fork of the Toutle River Valley at speeds in excess of 175 miles per hour," according to a website on the history of the eruption. The volume of mud and debris put in motion by Mount St. Helens was 3.3 billion cubic yards, or the equivalent of 1 million Olympic-sized swimming pools, the USGS says. The Mount St. Helens eruption killed 57 people in total, but it's hard to say how many of them were killed by the mudslide itself. "The soils of Nelson County had already been saturated from previous rain. The storm's east side reached as far as Fredericksburg, and it kept dumping more water — a total of 31 inches in six hours. With that water came flash-floods and landslides." For sheer loss of life, the so-called Vargas tragedy in Venezuela in 1999 tops the modern record books. The BBC says: "No one knows exactly how many people perished, although aid agencies estimate that it was anywhere between 10,000 and 30,000. The official figure for the number of homes destroyed is 20,000 while the number of homeless [was] estimated to be about 100,000." By comparison, the Oso mudslide is not large, Nicholas Pinter, a professor of geology at Southern Illinois University, is quoted by The New York Times as saying. Pinter says he's seen mudslides on a similar scale to Oso in the wilderness "that no one saw or cared about." The newspaper says, "[this] one, however, was especially destructive in terms of lives lost and property damaged." "Events like this are natural processes and only become tragedies when people find themselves in the way," Pinter tells the Times.